Who doesn’t love a DeLorean? I’m sure some don’t – maybe because of the fact that some people just have to hate something for the only reason that most people love it. Like, for example - hating The Beatles. How can anyone hate The Beatles?? As much as people seem to enjoy the DeLorean I do wonder if it would be quite as revered had it never been featured in the Back to The Future trilogy. I was surprised that most of these screaming fans appeared to only be kids no more than 16 years old – how do they even know about the DeLorean?! Did they actually watch Back to the Future? Perhaps kids these days do appreciate things that go beyond just Snapchat and Tinder. Even after 35 years of existence, the DeLorean still lives strong! The fact that teenagers today are noticing these DeLoreans might be an indication that these cars will likely be treasured for many decades to come. Buy one today and send me a 10% commission check when it’s worth millions 20 years from now! 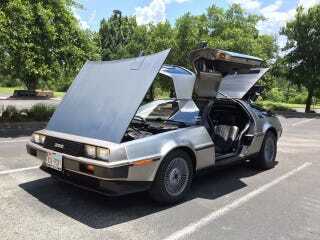 Very few cars grab your attention quite like the DeLorean. It’s wide, hugs the ground and of course, has a stainless steel body that is impossible to ignore. You stare at it in awe as it’s driving by because you immediately start thinking - how do you wash this thing? It’s actually quite easy. Grab your dishwashing soap, a sponge and have at it! Then towel dry. I’m assuming this works because how is the body any different from your stainless steel pot that you cook Ramen in every night? After waxing and polishing my cars over the years, I would think washing a car with a steel body would be a relief. Waxing and buffing is entirely too much work. And after all that labor you stand back to admire what you have accomplished only to realize that you wasted the last 6 hours of your life because there are streaks everywhere. The car slopes down and has noticeably larger wheels in the back than in the front which gives it kind of a “drag racer” look. Unfortunately, it’s nowhere near as fast as it should be to win a drag race of any sort. These are the little things that you don’t immediately realize about a car that you randomly come across every so often, until you randomly email someone on craigslist and ask them if you can drool over their prized possession in person. I really had no idea about how much stuff exists with the DeLorean in the way of aftermarket parts and various “DMC” branded paraphernalia. Take a look at this backpack B.J. bought. He carefully chose aftermarket DMC parts including pedals, the steering wheel, various pieces of upholstery along with many other needed upgrades like cameras. Believe it or not, the cameras are actually very important because you really can’t see much out of this car. tiny windows that can be rolled down. I don’t think I ever thought about whether or not you could open the windows on the gull wings but it turns out that you can! There is a small section of the window that you can roll up and down but they’re so small that they are probably only to be used in case of an emergency where you’re feeling so claustrophobic inside the car that you need to stick your head out and puke. So, how do you roll them down? By operating one of these humongous buttons. These buttons are so gigantic that they were probably created this way to fill up all that space between the seats. Or perhaps DeLorean just had big hands and needed massive buttons. you literally are laying down! Because of the way this car is designed, once you try to sit down inside the car you realize how reclined the seat is - much like a lazyboy. You could tilt the seatback up but then your head might hit the ceiling of the vehicle. And because of this, you have to make sure that your head isn’t sticking too far up because when you slam the gullwing door down, you might crush your skull. The doors were my favorite part of the car as they probably are with most folks. It’s so cool to be able to enter and exit the car using doors that fly up. B.J. actually installed an electronic release mechanism so that you can open up the doors using a remote. When the door opens, you’ll notice these floor mats with giant DMC lettering on it. It turns out that very few DeLoreans have these original floor mats. Apparently, there was a problem with these mats with the white lettering fading in with the black carpet which resulted in a recall soon after the DeLoreans were sold to customers. Because the original owner of this car never replaced them, they are still here! I have to imagine that there must be some Delorean owners out there who would sell their home to get their hands on these original floor mats. When driving around for a while, we never hit 88 mph and so we weren’t able to do fun stuff like travel back and forth in time. But, looking at the analog gauge, you’d never know where 88 mph exactly is because the speedometer cuts off at 85 mph. Although we didn’t do time traveling of any kind, there are so many things about this car that take you back to 1981 – like this original spare wheel. For some reason, 1981 was the only year of the car where there was a lid you could lift on the front hood to access the gas tank. For the other years of the car, you had open up the entire hood to get to the tank which is more of a hassle. The DeLorean has so many quirks that it’s understandable why it never quite caught on with critics or the general public. But because of the Back To The Future trilogy, the DeLorean will continue to be one of the most highly desired cars among a select group of people which apparently includes kids born in the late 90s. I fall into the group of people that love this car and I’m glad to have gotten an opportunity to check out B.J.’s DeLorean. He has kept it in such great condition that it is actually a better car than his daily driver. Now if you’ll excuse me, I’m going to go look for a flux capacitor so I can check out the 1600s. Torque Affair is about exploring my fascination with cars; I’m always on the lookout for things that interest me in the car world. Like Torque Affair and follow @torqueaffair!